St Herman’s Seminary is located at 414 Mission Rd in Kodiak, AK, two blocks away from Holy Resurrection Cathedral. Matins is served at 7:30 AM daily from Monday through Friday in the Seminary Chapel. Vespers is served at 4:30 PM on Monday, Tuesday, and Wednesday in the Seminary Chapel. On Thursday, the Akathist to St. Herman of Alaska is served at 6:00 PM at Holy Resurrection Cathedral. 6:00 PM Vigil at Holy Resurrection Cathedral. 9:00 AM Divine Liturgy at Holy Resurrection Cathedral. In 1844, St. Innocent [Veniaminov] organized the first Orthodox theological school in North America at Sitka, inaugurating a golden age of Orthodox educational ministry and mission in Alaska. This lasted until the catastrophe of the Bolshevik Revolution in 1917, when the last Russian-sponsored parochial school in Alaska closed. In September 1972, with the last surviving graduate of the Unalaska school in attendance, the Alaskan Diocesan Assembly voted unanimously to establish St. Herman of Alaska Pastoral School to prepare native Alaskans for service as lay ministers, church school teachers, catechists, choir directors, deacons and priests. At temporary quarters near Kenai, AK, St. Herman Pastoral School opened its doors in January 1973. By August of the same year, St. Herman Pastoral School had received official recognition from the Department of Eduacation of the State of Alasaka as a diploma-granting institution. The following year, the Pastoral School relocated to Kodiak at a campus adjacent to Holy Resurrection Church, where the holy relics of its patron repose. In 1975, the Holy Synod of Bishops officially accepted the school into the Church’s seminary system and, two years later, its name was changed to St. Herman Theological Seminary. The State of Alaska’s Commission on Postsecondary Education recognized St. Herman Seminary as a degree-granting institution and authorized it to award an Associate Degree of Arts in Theological Studies and a Bachelor of Sacred Theology Degree. Sadly, this accreditation was withdrawn in 1998. Reestablishment of accreditation is the foremost goal of the present administration. Students enrolled in the seminary qualify for scholarships and grants from regional native corporations and from the seminary itself. The student body of St. Herman Seminary is composed of both Native Alaskan and non-native students. At present, the Seminary offers housing for up to 9 unmarried students in its original building, and for eight married couples in 2 and 3-bedroom apartments. The library, diocesan archives and a museum are located in the main classroom building, which also houses the seminary administrative offices. The chapel is a replica of the first Orthodox church built in North America in 1794. 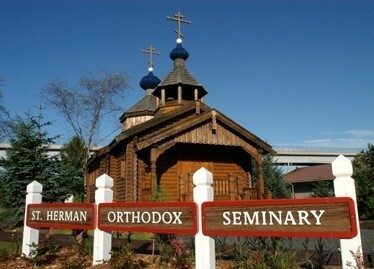 St. Herman Orthodox Theological Seminary exists to proclaim the universal doctrine of the ancient, undivided Christian Church. A common image of the Church is that of a hospital. The Church offers spiritual health to Her members, true wholeness to the human person. Orthodox Christianity recognizes that health is the proper relationship, the communion of man with God and with his fellowmen according to Orthodox Christian tradition. If the Church can be described as a hospital, the Seminary can be likened to a clinic, training men and women as technicians in the therapeutic science of theology. The Holy Church Fathers regarded theology as the science of sciences, for it is the teaching of the Church about spiritual health and the discipline that cures the whole person, soul and body. This is not a philosophy, but a way of life, an applied theology. The Seminary fulfills its most basic purpose, remaining true to its historic missionary heritage. The Seminary strives to continue the heroic educational and evangelistic work begun by Ss. Herman, Innocent, Yakov, and the host of dedicated clergy and laity who struggled to increase the presence of Holy Orthodoxy in the Diocese of Sitka, Anchorage, and Alaska. These holy examples are heralded in hymnography as unmercenary physicians. The primary objective of the Seminary remains the education and, as God wills, the ordination of spiritually mature Orthodox Christian men to the Holy Diaconate and Priesthood. The Seminary also provides the theological, liturgical, and moral foundations necessary for the nurturing of various other vocations. The Church in Alaska hopes to maintain a full complement of indigenous clergy and laity. Therefore, the Seminary curriculum is arranged to prepare readers and catechists, religious educators and counselors, as well as deacons and priests. Objectives specific to St. Herman Seminary are: #- To prepare worthy candidates for the Holy Priesthood and Diaconate of the Orthodox Christian Church. #-To train students to assume the responsibilities of a church reader who can lead services in the absence of clergy. #-To prepare worthy candidates for positions of leadership, such as religious educators, in their worship communities. #-To prepare certified substance abuse counselors for service to their communities. Preparation for service to the Church, as clergy or laity, requires students to live fundamentally as Orthodox Christians. Mankind is created by God. Therefore the height of humanity is achieved through communion with God. Knowledge of God is revealed in prayerful study of the Faith and a life of active virtue. Students must demonstrate godly attributes: humility, patience, devotion, piety, and charity. Seminary life provides ample opportunity to develop these virtues, so that the vision and values of Orthodox Christianity are not only the subject matter of course work, but increasingly a way of life. The Seminary trains its students in this practical theology. St. Herman Seminary is committed to an understanding of theological education that includes all aspects of the person. The person possesses infinite value, being created in the image and likeness of God. St. Irenaeus wrote, “The glory of God is a human being who is fully alive, and the life of such a person consists in beholding God.” Worship is therefore at the very heart of Orthodox Christians’ being and life, especially for those called to teach and preach. Active participation in daily worship is integral to the Orthodox Christian worldview. Students should not only understand but delight in the liturgical life of the Church. Students preparing for service to the Church are held to the same ecclesiastical regulations, moral standards, and models of behavior as are expected of those ordained in the Church. As a missionary institution of the Diocese of Alaska, the Seminary is intensely interested and committed to enhancing and strengthening Native Alaskan languages and cultures, particularly as play a role in the expression and propagation of Holy Orthodoxy. The Seminary fulfills the commission of the Church to be incarnational, bearing the Gospel of Jesus Christ to all people. The Seminary faculty encourages research projects and programs in the field of Alaskan Native culture embracing the Church. The Seminary is aware of, and committed to combating the various social problems that plague society, and Alaskan communities in particular. Valuing personhood as a unity of soul and body, the Church is concerned with the health and eternal salvation of the whole person. Courses in counseling disciplines, together with discussion, lectures, and seminars relating to public health and social policy, constitute another element of the Seminary curriculum. The Seminary provides an education not only to those preparing for ministry, but also the Seminary nurtures the students’ entire families in residence. While students receive their education, their families must be supported. By fostering the families’ wellness and wholeness, the Seminary improves the quality of student life and of the students’ future ministry. The Seminary is aware of the place family holds. Familial themes pervade the letters of St. Paul. Scriptures also attests that Christians are bound together as members of one Body. The Seminary strives to fulfill this calling.